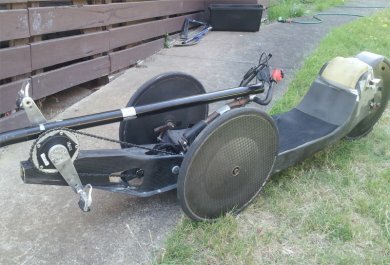 This web page will document recumbent trike types, geometry and possibly my recumbent trike build. 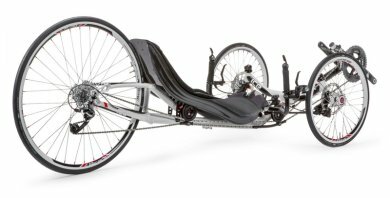 As with most recumbent vehicles there are several varieties of trikes, each with things they excel in, and their compromises. In general, trikes are slower than bikes. This is because of the rolling and air resistance of the 3rd wheel, and also because of tire scrubbing that happens while pedaling or cornering. They are much easier to ride than 2 wheel recumbent bikes, because of the whole "no balance required" thing. They are also very popular, because you get that lowracer grin without the lowracer learning curve. 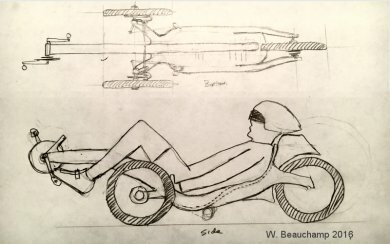 The delta trike design has two wheels in the back and one in the front. It's the easiest trike to build because you can use normal bike steering. In general it doesn't handle high speed corners as well as a tadpole trike, but it behaves well going in a straight line and brakes predictably. A Delta trike is comparable to a long wheelbase recumbent in that it is designed more for comfort than speed. 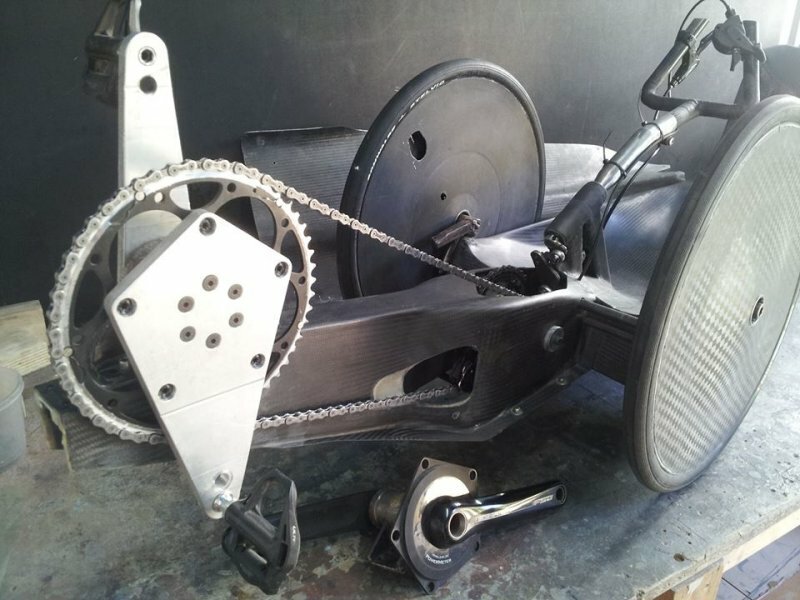 To compensate for these handling issues many types of leaning trikes have been built. 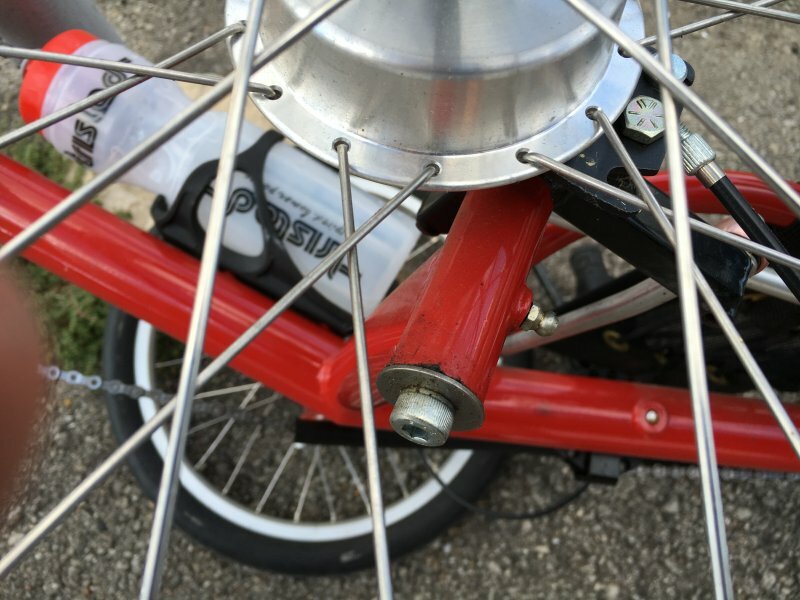 In general leaning trikes are faster than fixed trikes because they eliminate the tire scrub. They handle just like a bike, but are heavier. Here's a shot of me racing my leaning trike. 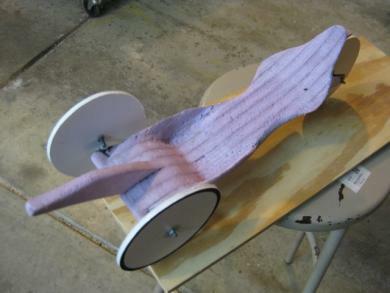 It worked well except in extreme cornering where the tilting unit would run out of ability to lean and the rear wheels would start to slide in a disconcerting yet controllable manner. The tadpole trike design handles high speed corners well, but at higher power levels and when braking hard can experience "tail wag". Tadpole trikes are faster than Delta trikes due to their lower seating position. In terms of speed, the lower you can get, the faster the trike will corner. A lower seat height and a more laid back position gives less air resistance. Tadpole trikes generally only have brakes on the two front wheels. 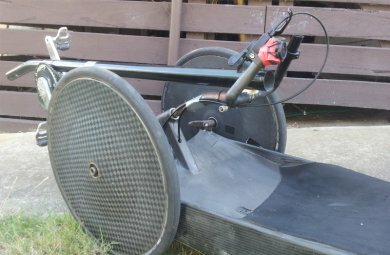 Because the Tadpole trikes with no suspension seem to perform the best in a racing environment, that's what this page will focus on. Trike rear suspension is for comfort on bad roads. If designed well, it can be implemented without a performance degradation. 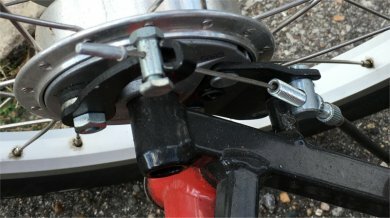 Most rear suspension solutions use a mountain bike gas shock. Front suspension is for handling, but can degrade cornering performance due to added lean to the outside. Most velomobiles have full suspension to provide good handling at high speeds on unknown surfaces. There are many ways to accomplish front suspension. 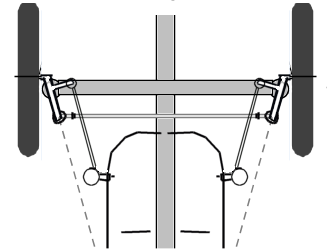 The most effective is MacPherson strut, like velomobiles use, but that is not practical for a non-faired trike. 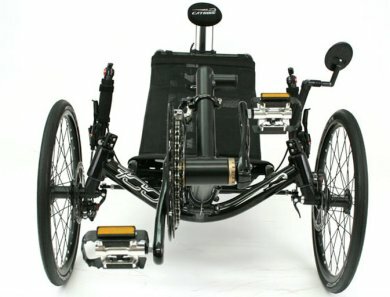 Many other options are available (See Catrike, ICE and Steintrike), but are complex (expensive!). Rear steer, center steer, lean steer, etc. These are all interesting engineering projects but off topic for this page. Tadpole trikes are more difficult to build than Delta trikes because of the steering geometry. Ricky Horowitz' Recumbent Trike Design Primer is a great resource for people who are designing and building their own trike. 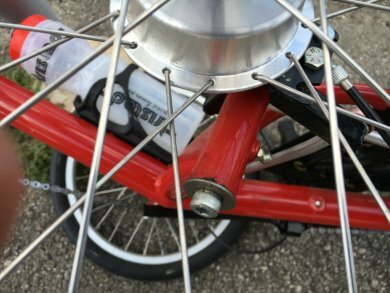 The vertical pivot assemblies for the front wheels are called kingpins. They must be angled properly to allow the trike to handle well. 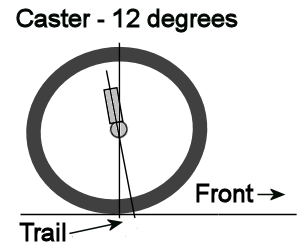 The caster is the trike equivalent of trail on a bike. 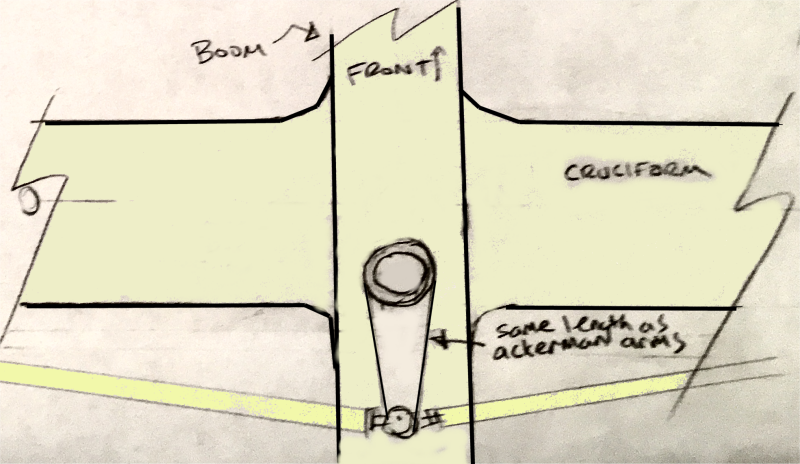 From a side view a line through the kingpin intersects with the ground about 2" in front of the wheel. 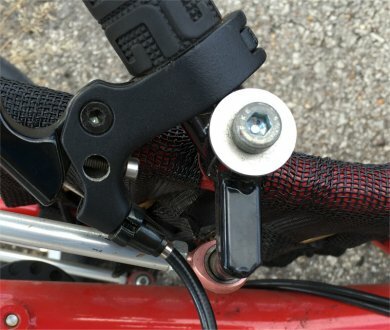 This helps the bike go straight at higher speeds. 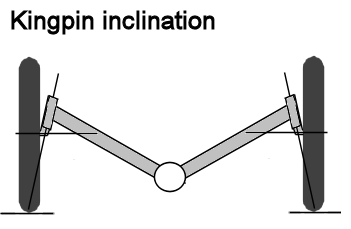 The kingpin inclination is also important. To reduce tire scrub which improves rolling efficiency, the kingpin centerline should point to the center of the tire where it touches the ground. Ackerman compensation steering is used to minimize tire scrubbing when cornering, and also reduces bump steer. Without it the tires point more in different directions the harder you turn. In the drawing you can see that the steering brackets point toward the center of the rear wheel. 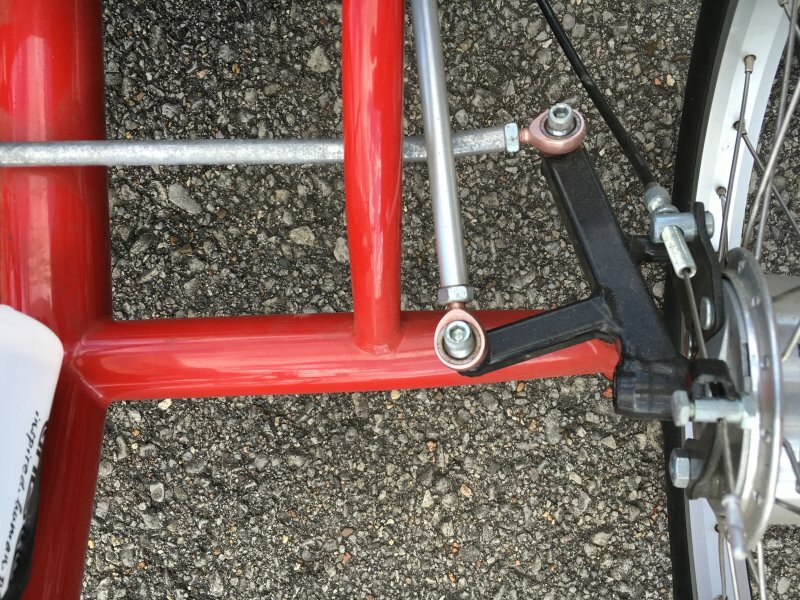 The tie rod connects the steering of both wheels together. The tie rod attaches to the ends of the steering brackets with rod-end bearings. Distance from the center of the kingpin to the tie-rod is about 4.5 inches. The last piece of the puzzle is toe-in. This is the adjustment of the front wheels to make sure they are parallel. 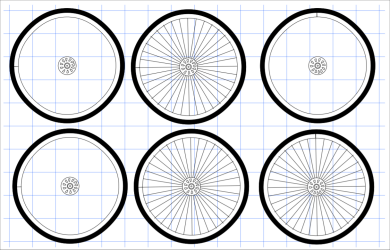 Toe in is the distance between the front wheels measured at the back of the wheels minus the distance between the front wheels measured at the front of the wheels. Ideally it would be 0 inches, but 1/16" is recommended. I think that's because 1/16" is about the smallest distance you can measure. A Callibro is a Catrike tool that allows you to accurately adjust the toe-in. It's a telescoping tool that you put between the brake surfaces of the two wheels at the front, then lock into place, then use it to check the wheel distance between the brake surfaces at the back of the wheels and adjust as needed. I made one using a 3/8" rod that slides inside a 1/2" tube. The Catrike one has a fancy lever to allow it to lock at the desired length. Mine just uses stiction to hold it in place for now. You can also use a telescoping antenna, which can be obtained inexpensively. These tools allows you to get the wheels very close to parallel. As with everything else trike shaped, there are many options. 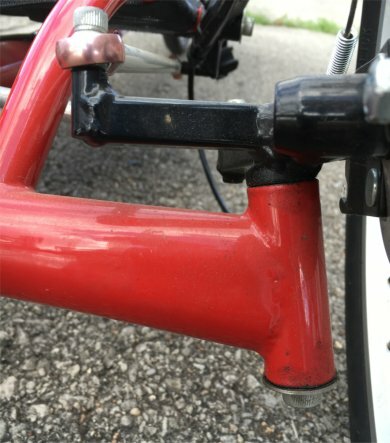 Most trike manufactures seem to have settled on handlebars connected directly to the kingpins "direct steer". This is the least expensive option and works fine for most pedestrian applications. Other options are remote under seat steering, remote above seat steering, and side stick steering. Traditional under seat steering provides a comfortable riding experience as it isolates your hands from the vibrations of the wheels, and allows the steering ratio to be adjusted, but it is slower due to the "wide load" effect. Above seat steering is faster but makes it harder to get on and off of the trike. 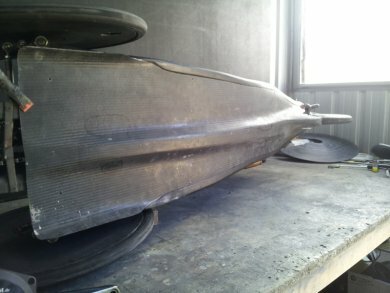 Here's Catrike's racing model, the 700. In this picture you can see the kingpin inclination, and that Catrike uses a direct steering handlebar. This is a race proven trike with a well triangulated frame. 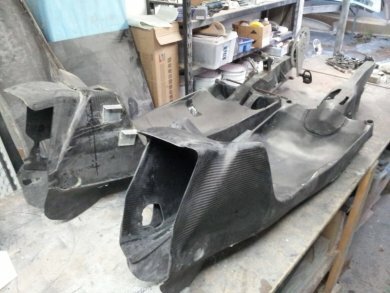 Here's a side view showing some of the Catrike 700 triangulation and the laid back seating positiion. 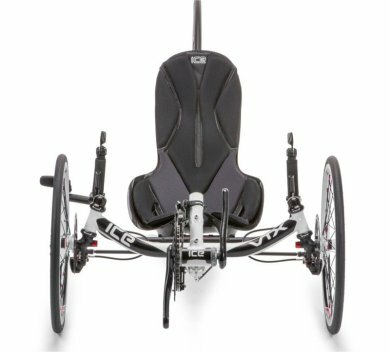 Here's the ICE VTX, another low, race oriented trike with laid back seat. It uses the same conventional kingpin layout and headsets for steering bearings as the Catrike. The way it differs is that it uses an under-seat U bar indirect steering. 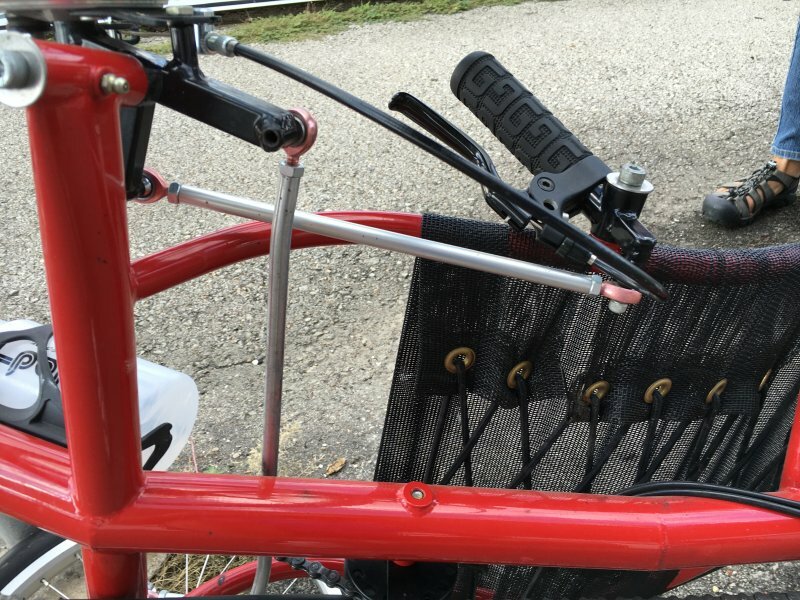 Also it utilizes a hardshell seat rather than the mesh seat on the Catrike. One other major difference is the lack of triangulation between the cruciform and the rear stays. The steering system I like the best for trikes is side stick steering. This allows the steering to be tucked in close to the body, and for the steering handles to do double duty as side bolsters to hold you in the seat during high speed corners. 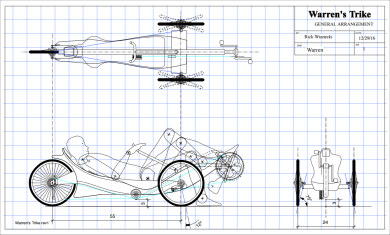 This top view diagram shows how the Greenspeed SLR dual side stick steering is configured. 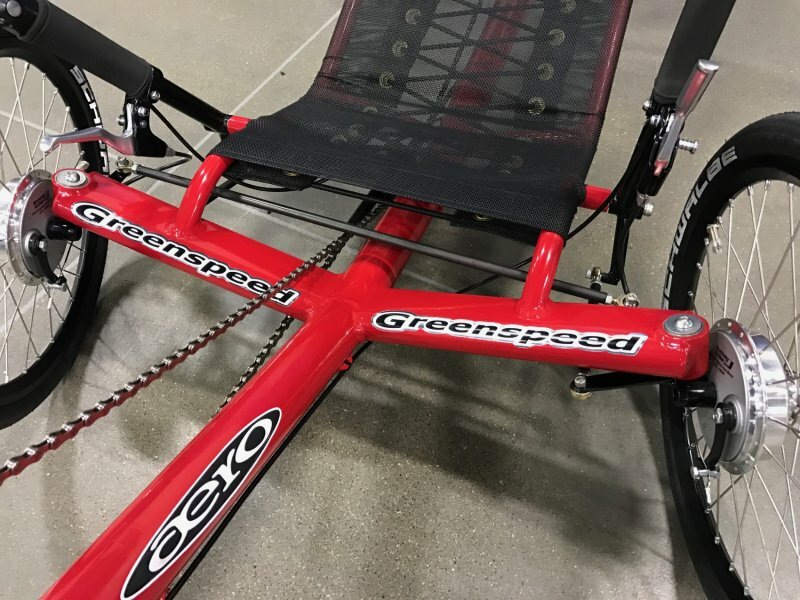 Here's the GeeBee Greenspeed SLR cruciform and steering. Trike width is 26"
Closeup of the Kingpin. 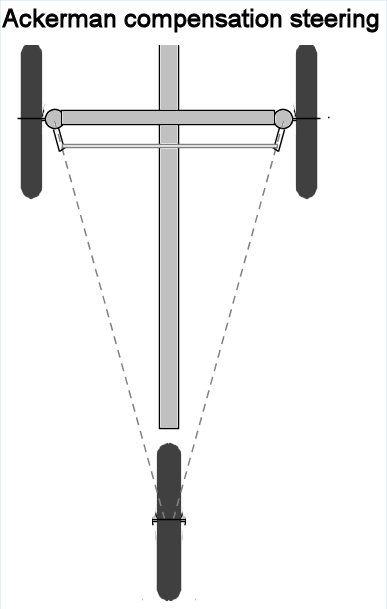 Note that the axle is mounted in front of the steering axis and the top of the steering pivot, but it is directly above of the bottom of the steering pivot. 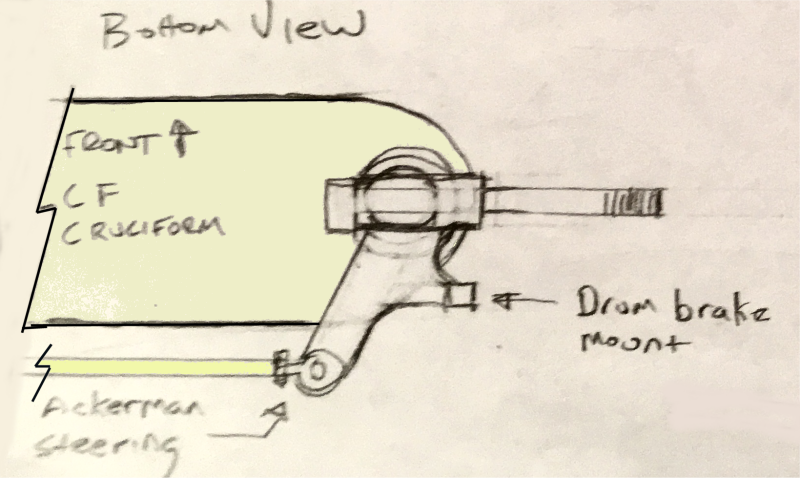 This shows the mount for the drum brake. 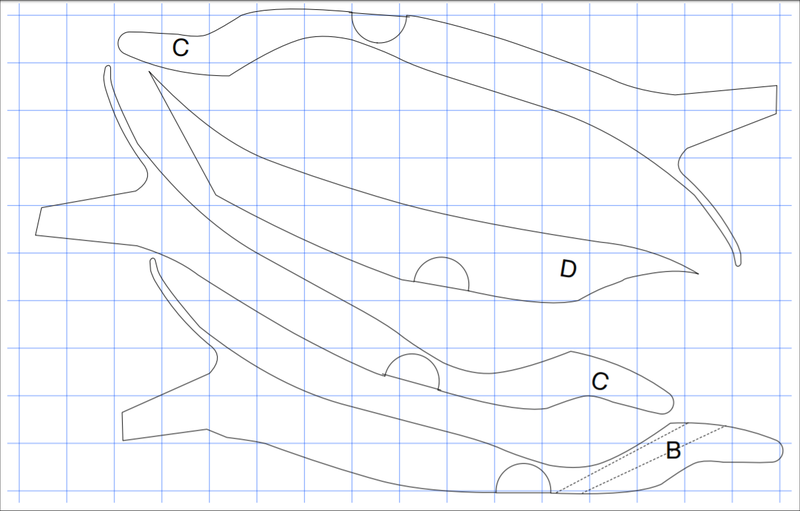 This shows the bracket for the steering. Also it shows that this Greenspeed uses bushings instead of headsets like most of the other trike manufacturers. The kingpin inclination on the SLR points to a spot a few inches inside the tire patch. If the trike had larger wheels it would point at the tire patch. This bracket location is somewhat unconventional as most trikes have the axle kingpin assembly located below the cruciform tubes. There's a grease fitting to ensure the bearings can be easily re-lubricated. This shows the steering control rod and mounting of the steering handle. Here's a closeup of the handlebars. 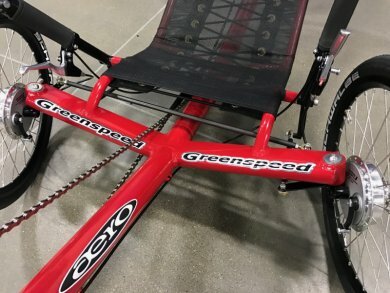 Here's a photo of a 2016 Greenspeed Aero from Recumbent Cycle Con 2016. 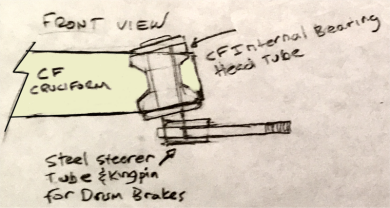 You can see that they have moved the kingpin assembly to below the cruciform, and changed the bearing assembly to what looks like an internal headset. 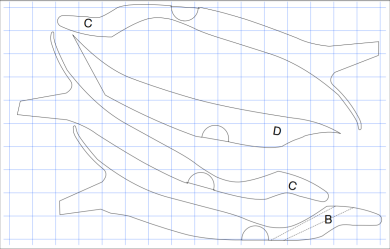 This allows them to ovalize the cruciform tubing to cut down on frontal area a bit. The gentle reader may ask, "Why don't you just pick a trike and ride it!". Oh, I have reasons gentle reader, reasons. After riding and racing Christine, the Greenspeed SLR, I can say it handles corners well and is fast in a racing environment. I do not however fit in the seat as they are designed for "normal" height humans and major reconstructive surgery would need to be performed to make that happen. After racing and riding the ICE Vortex (almost a VTX!) I can say that the seat fits me well and it is comfy, but due to a lack of triangulation it does not do well in a racing environment. 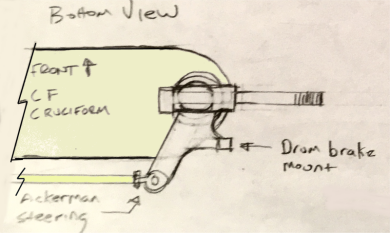 The VTX is stiffer in the rear and has a seat which can be laid back more that the Vortex so it would be better, but is still has just a monotube and that will allow the rear wheel to deflect in the hard corners. That leaves the Catrike 700 yet which I not raced or ridden in anger. It is however quite popular in the HPRA racing series. If I were to obtain one, it would need some modification including a hardshell seat to get me a bit lower, and probably a change to indirect steering. If my backside can fit between the seat rails they would make great side bolsters to prevent sliding off the seat in the hard corners. The final option is of course, building one from scratch. Because it's Winter and I have nothing better to do, I'll explore the scratch built option. Here's what the Catrike 700 would look like with a 15 degree seat and an extra tall rider in the NoCom position. I had to stretch the frame 4 inches and crank the seat back 10 degrees. Interestingly, after extending the boom normally, the BB is in the correct place for the NoCom position. * 15 degree hardshell seat integrated with the frame for an aero underseat area. 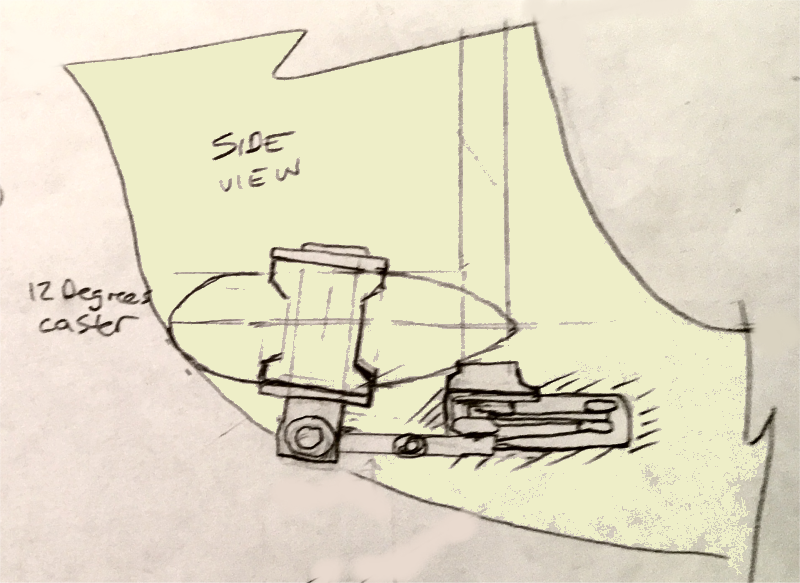 Here's the first conceptual drawing of the trike, drawn with criteria above in mind. Conceptual design 2. 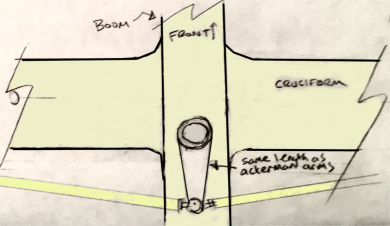 Changed cruciform and boom to reduce effective length of boom, which will improve power transfer. Power side chain will pass between cruciform and seat. Here, I cleaned up the hand drawn image in a paint program. Total length - just shy of 8ft. Thom needled me for a "gunner bars" version. Dammit, I like it. All my other bikes have tiller bars so why not this too? The tiller bar steering tube would need a linkage to the tie rod for steering. This will also strengthen the boom for better power transfer. 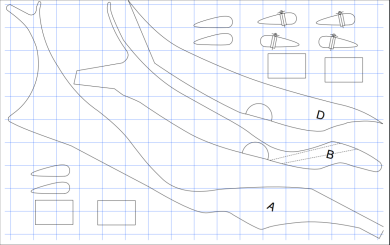 I'm figuring out the steering in a rough sort of manner. This shows the remote steering linkage to the kingpin Ackerman lever. The remote steering linkage will reside in a slot cut into the frame. 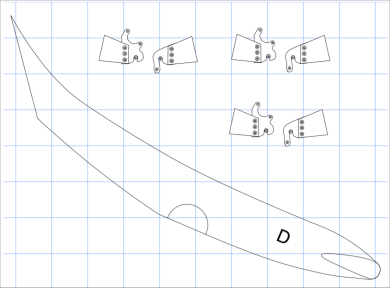 These drawings are not to scale. This bottom view shows the bell crank arm which links the long steer tube to the control arms. It should be the same length as the kingpin Ackerman lever. This view from the front shows the internal bearing head tube and kingpin assembly. I will need to figure out the actual angle once I get all the parts together. 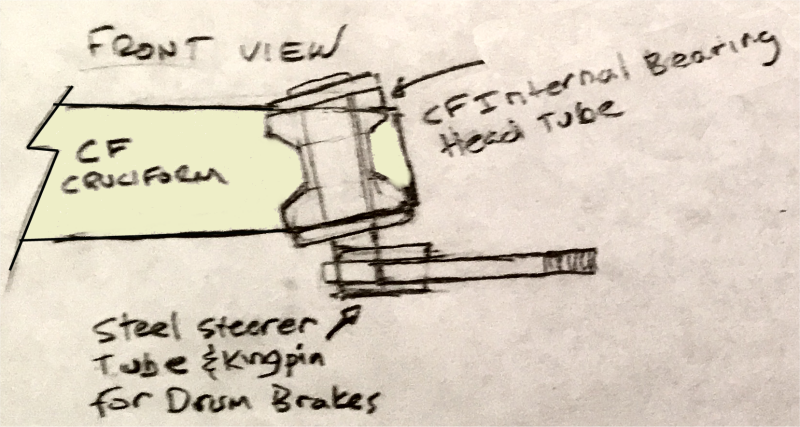 Bottom view of the kingpin, showing the Ackerman lever and drum brake mount. Here's a cool racing trike that Tim Corbett of Australia built. It was designed to be faired, but there are many interesting aspects which would work on an unfaired trike as well. It has an extremely laid back integrated seat, above seat steering, and the kingpins are mounted directly to the sides of the seat. 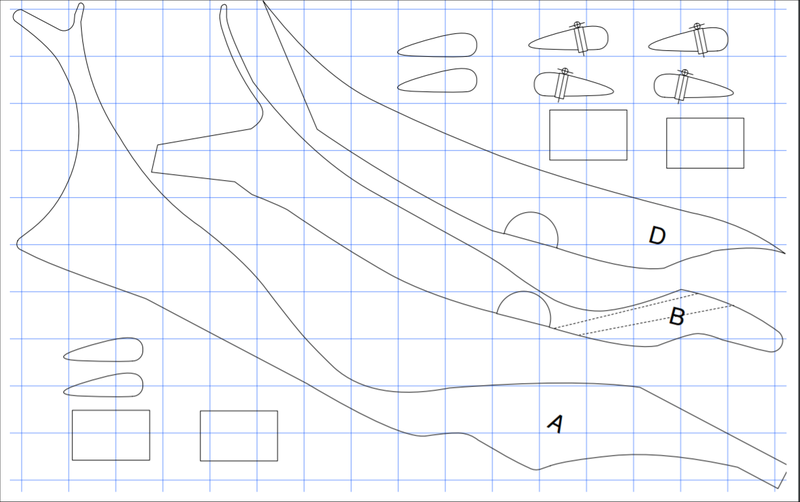 This design is probably too laid back and narrow for an HPRA racer but would be great for longer tracks without tight turns. The drive train runs through the chassis. In this photo you can see the steering bell crank. 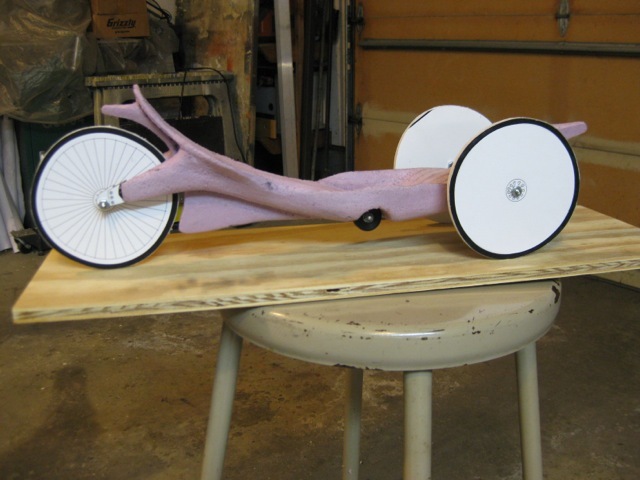 He has built two versions of this trike, and still has the molds. As you can see, the design is not optimized for use without a full fairing, but due to it's monocoque design it is likely no less aero than a traditional cruciform trike. The trike is well faired underneath, which is an important area that is generally ignored by recumbent (and auto!) designers. After seeing Tim's excellent design I will need to think more about my own design. Moving the the front wheels back several inches to coincide with the front edge of the seat makes very good sense from a construction and strength standpoint. Now that I look, it seems that several trike designers have done this. 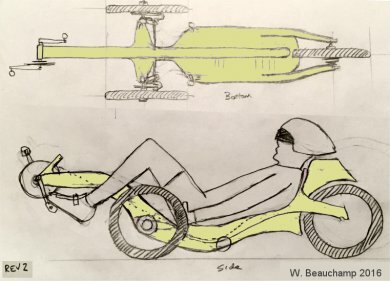 While I can't recall reading anything about how tadpole front wheel location effects handling, intuitively I can see that pushing the front wheels back changes the weight distribution toward the front. Too far back and the the back wheel will slide too easily in hard cornering. Too far forward and the front wheels will "push" and loose traction in a corner. Neutral handling is best. Initially you would think that the front wheels would provide twice the traction of the rear wheel in a corner, but in a hard corner, most of the front weight is on the outside wheel. 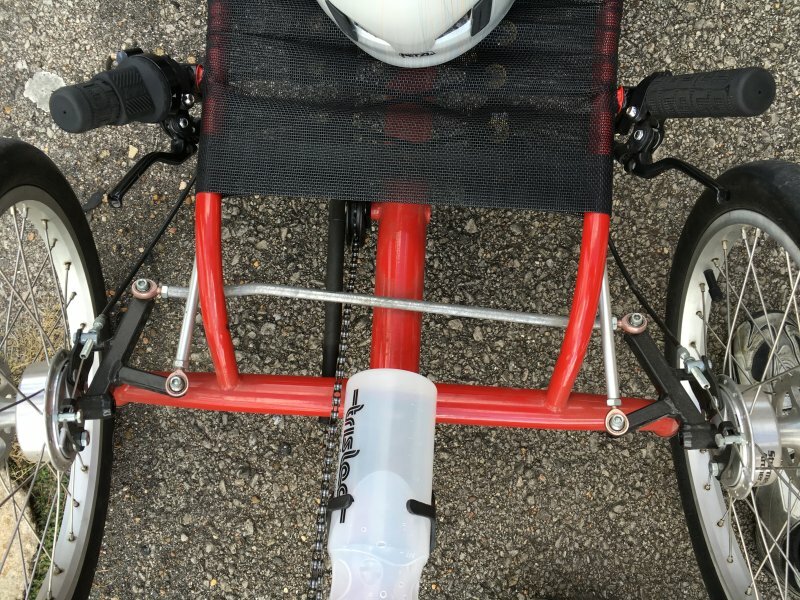 In reality, unless the trike is very off balance, you will start to tip over in a hard corner before reaching the traction limits of the front or rear tires. 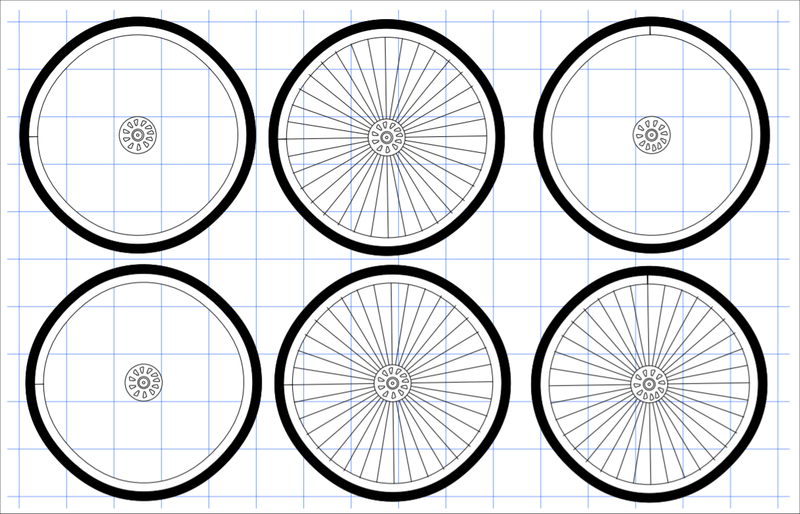 I think I will leave the front wheel location alone. Tim's Steer tube is about 45 degrees as opposed to mine which was designed at 90 degrees. I think the 45 degree design is better as it negates the need for the tiller. The belly pan is cool, and it fairs the rear wheel well. 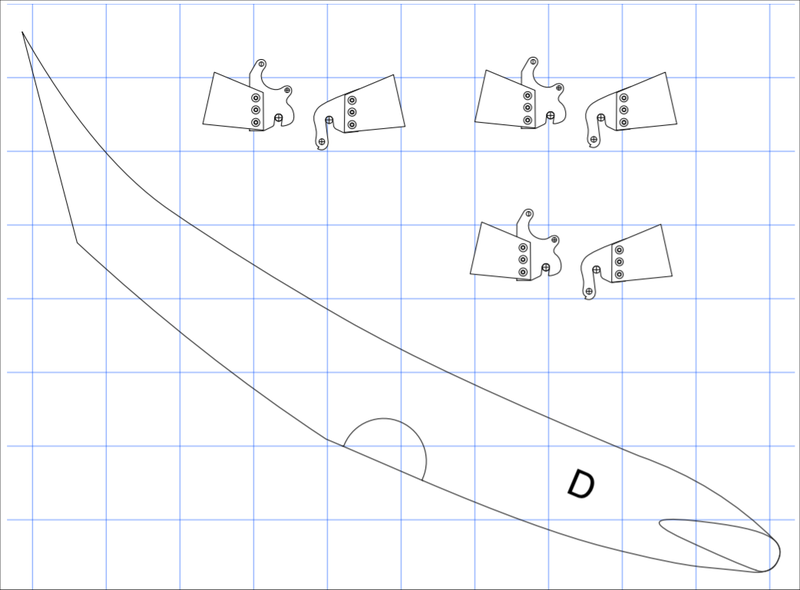 I need to think about total surface drag vs aerodynamics. Does it makes more sense to make the under seat area larger and enclose the drivetrain, or just make it smooth and aero and let the chain dangle? 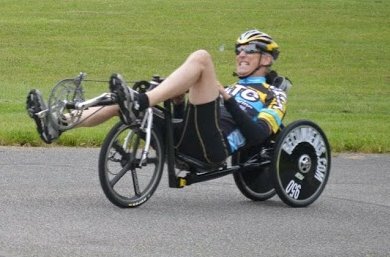 Rick Wianecki has been designing and building recumbent bikes and trikes since well before me, and was one of the original members of the WISIL HPVers. He's still involved in the HPV scene and is a strong believer in the composite over foam building method. When he saw what I was planning he volunteered to create the trike in CAD using a scale model of me to ensure that it was sized properly. We went back and forth several times to tweak the design and I think what we ended up with is extremely close to my latest design thoughts. He then generated the templates needed to build a 1/4 scale model. Very cool! 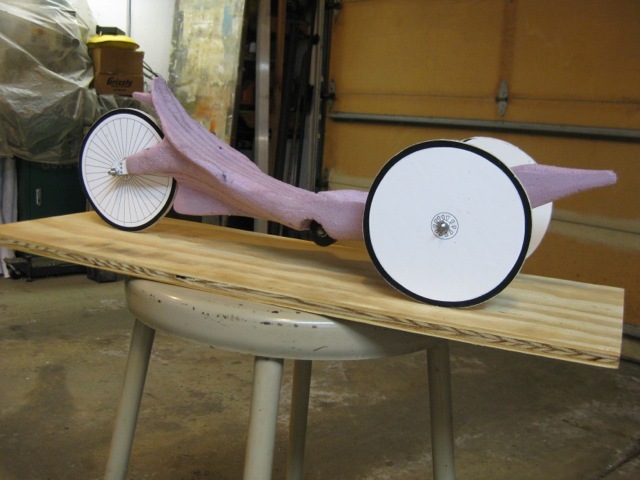 He then cut out the sections and built the 1/4 scale model trike, using 1/2" insulation polystyrene foam. 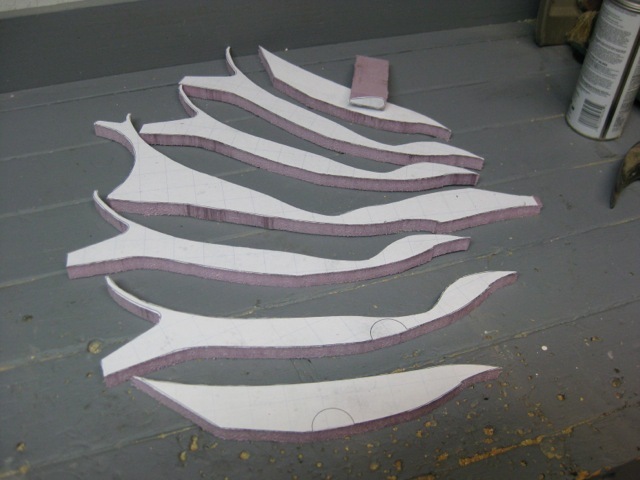 Rick even made scale kingpins, dropouts, and a scale idler under the seat to allow us to ensure that the design will work before building the full scale foam core. The major change between my last drawing above and this model is incorporating the cruciform into the leading edge of the seat. 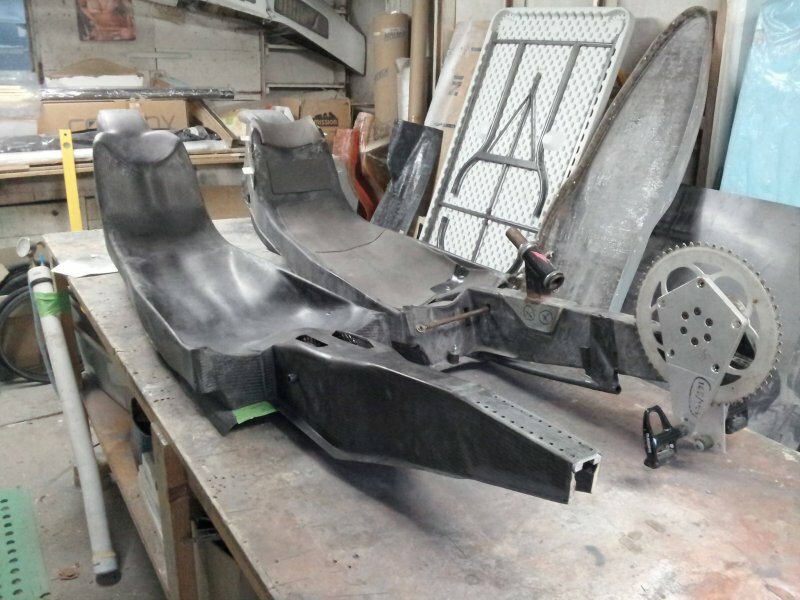 The trike will have cruciform stubs sticking out wider than the seat because this bike will need to go fast around the corners. More tweaking. Moved the BB as low as possible to bring it closer the "The Position". It's now about 8" above the seat pan.